Lookout Tower erected by the residents in memory of Hume and Hovell who passed nearby in 1824. 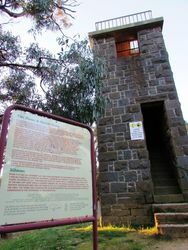 The lookout tower is made basalt stone from the tower of the old Kilmore Gaol. In connection with the forthcoming Hume-Hovell centenary, the committee formed at Kilmore is making good progress. A combined cairn, with spiral stair, will be built on the lookout which overlooks Mount Disappointment and the track taken by the exploring expedition 100 years ago. The cairn will be of blue stone, given for the work by the Kilmore Dairy Company. The stone formed a portion of the old Kilmore gaol. At a meeting held last week Mr. R. Fennelly, C.E., engineer of the shire, submitted a plan of the structure, which will be 30ft. high, with a platform 10ft. x 8ft. The sum of £74/19/ has been raised in the district towards the construction of the cairn, and nine of the residents have made horse teams available to assist in carting material to the site, which is one of the finest to be found in this picturesque locality. The shire council is also putting in order the motor track which runs to the lookout. The track had been made somewhat uneven by the winter rains. Everything will be in order by the first week in December. Sir James Barrett, who is taking an active interest in the centenary, has promised the Kilmore committee that he will unveil the memorial tablet on the cairn. Argus (Melbourne), 11 October 1924. On Saturday next the unveiling of the Hume and Hovell memorial on The Lookout by his Excellency the State Governor, the Earl of Stradbroke, will take place. The Governor, accompanied by his private secretary, Captain Keppel Palmer, will arrive by car from Melbourne in Kilmore at 12 o'clock. He will be met at the town hall by the shire president (Cr Harper) and councillors and afforded a civic reception, at which President Harper will present him with an address of welcome on behalf of the residents. The governor will then be the guest of the shire council at luncheon at the Royal Oak, also parliamentary representatives who may be present. At 12.30 p.m. the party will leave for The Lookout and upon arrival there the unveiling of the memorial will take place between 1.30 and 2 p.m.
Kilmore Free Press (Kilmore, Vic), 11 December 1924.
Who Passed Near By 13th Dec 1824.